Reaching the top of the cliff the Australians discovered that their commanding officer, Colonel L.F. Clark had been killed and a major from Western Australia was badly wounded. 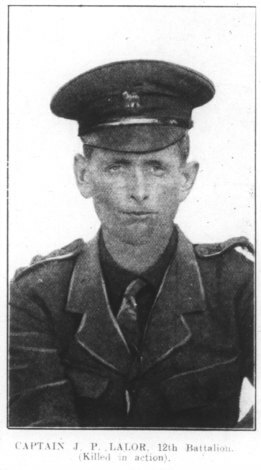 Captain Joseph Peter Lalor then took command of the 12th Battalion, G Company. Grandson of the Eureka leader and the eldest son of Dr Joseph and Agnes Lalor of Richmond, Joe was educated at Xavier College, Kew, choosing disciplined adventure rather than following his father into medicine. He joined the British Navy, but found it not to his liking (maybe the spirit of his forebears might have had something to do with it). For three months according a newspaper report his life was 'fighting, starving and excitement.' However the rebels were crushed and when it came time for revenge executions, Lalor made a daring escape from Argentina without his promised pay packet. Eight months later on 25 April 1915 he was a member of one of the first detachments of ANZACs in the dawn landing at Gallipoli. The key objective of the troops was Baby 700 about 180 metres above sea level. It connected Russell’s Top with Battleship Hill, part of the Sari Bair Range and was reached by small parties of the 11th and 12th Battalions a few hours after landing. The official history of the 12th Battalion states: 'Lalor then moved forward on to the seaward slopes of Baby 700 where the fighting was thickest. Although the mental strain and anxiety, which he had experienced since landing early in the morning had been enormous, he never-the-less rallied his men and waving his arms, shouted ‘Come on, the 12th. The words had hardly passed his lips when he fell dead and ‘the 12th’ lost one of its most gallant and capable officers. That day, Baby 700 was won and lost twice. Joseph Peter Lalor was buried at Baby 700 Cemetery, the most northerly of the old ANZAC cemeteries. Ten special memorials were erected to men known to be buried there. His epitaph reads: ‘It is sweet and proper to die for one’s country. The Lord Thou Knowest Best’. Peter Lalor Philp is the great great grandson son of Eureka's Peter Lalor and Captain Joseph Lalor was his grand uncle. A wonderful story - tragic and so insanely bloody Irish! Dear Peter, Great to read your article. We currently have a ceremonial knife that we believe was given to Peter Lalor on display in the Changing FAce of Victoria. The inscription on this knife reads: ‘Presented to the Hon. Peter Lalor by the People and Miners of Ballarat for his Leadership during the Seige at the Eureka Stockade 22.12.55.’ The knife was made in Ballarat by an Irish emigrant, John Tynan. It is a Bowie knife. It is thought that Bowie knives were introduced to Victoria by the gold diggers who arrived from the Californian goldfields. The item is on loan from a private collector, and we've no details about its provenance. I would be pleased if you had any further information about it. Is it possible it is the weapon described in your account in this article. Kind regards Ann. I am tracking the movement of a presentation bowie knife presented to Peter Lalor in 1855.